PARIS — French President Emmanuel Macron asked for an evaluation of possible protest security measures Sunday, a day after a Paris demonstration against increased taxes and living costs devolved into France's worst urban riot in a decade. Fires were started at six buildings and more than 130 makeshift barricades and 112 vehicles were torched, Delpuech said. Paris prosecutor Remy Heitz said 378 people remained in police custody as of Sunday evening, 33 of them minors. Earlier Sunday, Macron visited the Arc de Triomphe, which had damaged statues as well as graffiti. One slogan on the famed war memorial read: "Yellow jackets will triumph." He then headed to a nearby avenue where activists battled police Saturday to meet with firefighters, police officers and restaurant owners. At the security meeting, the French leader asked his interior minister to consider making "adaptations" to security procedures to try to contain ongoing protests sparked by rising fuel taxes, Macron's office said in a statement. Macron also asked Prime Minister Edouard Philippe to meet with the heads of France's major political parties and representatives from the grassroots movement behind the protests. Plans for an earlier meeting between the prime minister and representatives of the movement collapsed last week after a request to broadcast the talks live was rejected. It was the third straight weekend of clashes in Paris involving activists dressed in the yellow vests of the new protest movement. 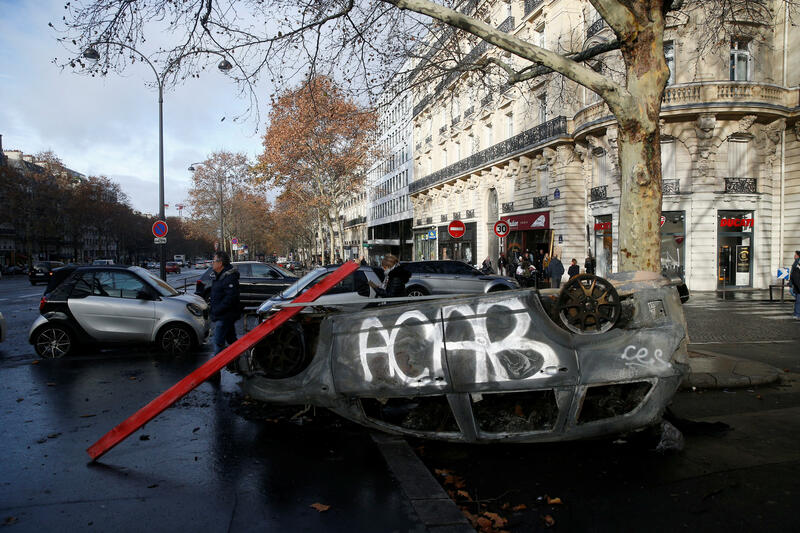 The grassroots protests began Nov. 17 with motorists upset over a fuel tax hike, but have grown to encompass a range of demands and complaints that Macron's government does not care about the problems of ordinary people. The yellow vest protesters have called for repeat demonstrations next weekend, leaving some residents worried about another violent outcome, Reuters news agency reports. The scene in Paris contrasted sharply with protests elsewhere in France that were mostly peaceful. "It's difficult to reach the end of the month. People work and pay a lot of taxes and we are fed up," said Rabah Mendez, a protester who marched peacefully Saturday in Paris. "(Violence) has nothing to do with the peaceful expression of a legitimate anger" and "no cause justifies" attacks on police or pillaging stores and burning buildings, Macron said.